Call us and add our cookbook to your reservation. It can be waiting in your room when you arrive. 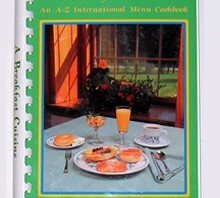 A Breakfast Cuisine: An A-Z International Menu Cookbook from 7 Gables Inn offers a wide variety of taste experiences. Travel the world, breakfast by breakfast! $15.00 – Call us or email to order today.